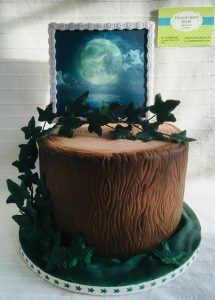 All of my creations, ie, birthday cakes, celebrations cakes, etc, are individually designed, planned, baked and created by myself and all edible items hand-made, again by myself. My cake prices can vary considerable depending on what sort of cake you want. The best way to start is to contact me with details of the event, the style of cake and the number of people you are catering for. To give you a rough idea of costing please see my “Costs, Contact and Payments” page. 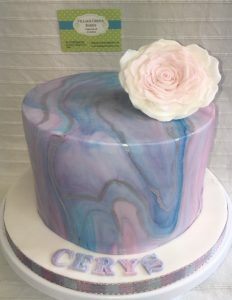 Please check out my Picture Gallery for ideas of cakes previous customers have ordered. 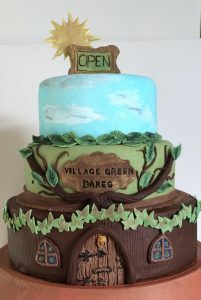 Use my downloadable Village Green Bakes Initial Contact Form to book a no-obligation consultation, to get a quote or to order your baking requirements. I can meet with you to discuss your baking needs/theme and between us, we will agree on what’s required. Most importantly, every step of the way, you – the customer – will be kept up-to-date on progress. Use my Village Green Bakes Initial Contact Form as a starting point. 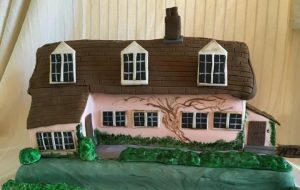 Also see Village Green Bakes on Facebook or check out my Testamonial Page on my website for customer comments and previously-supplied cakes. I can supply themed cupcakes and matching birthday cakes for parties and events. All orders will require a deposit and completion of a booking form. I work from my specifically-designed-for-baking kitchen to produce specialty celebration cakes and delicious individual bakery items. 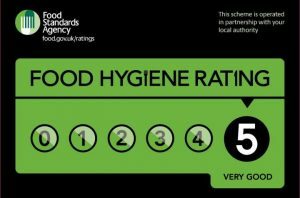 I am registered with Hampshire County Council and in November 2018 was awarded Environmental Health & Hygiene 5* Certificate which ensures that all products are baked in my scrupulously clean, newly upgraded kitchen. I am happy to bake celebration cakes which you can collect from my bakery in Waltham Chase by arrangement, but I will deliver within a 5 mile radius, freshly baked for any occasion, for a fee of £10. Please contact me at Villagegreenbakes@gmail.com or text/phone 07791 266426 for more information.